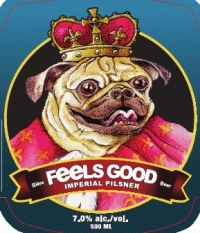 FREDERICTON, NB – Northampton Brewing/Picaroon’s is preparing to release their Feels Good Imperial Pilsner to ANBL stores next month. The beer was created last year as a collaboration with FeelsGood.ca, a website/forum for Fredericton’s music and arts community. It’s been available on tap at several pubs around Fredericton, and at live Feels Good events, but this will be the first time it’s available in bottles. Very excited to see the Pilsner in bottles, hopefully I can get some before it sells out. I know it has had a hard time staying on tap!